Commercial flat roof repair with the old Hot Tar and Gravel on it. These roofs have come a long way, but time has come where they are not repairable any longer. Over the years the hot tar becomes brittle and start to crack. The stone aggregate hides these cracks, so it is not easy to spot them. The following suggestions are equally good. It is how the flashing and other obstacles are on the roof that will determine what method to follow. 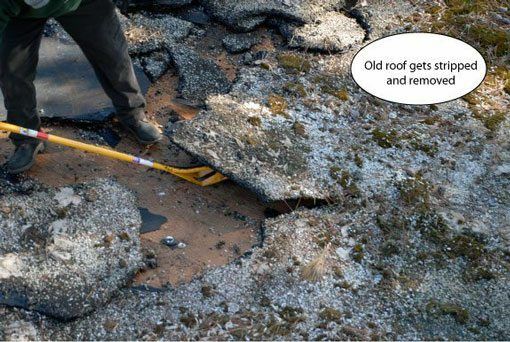 There are two ways to deal with such a roof when it is time to replace it. Rake the stone evenly and remove debris. Install 1/2″ fiberboard over the stone. Remove the existing tar and gravel. Clean the roof and flashing. 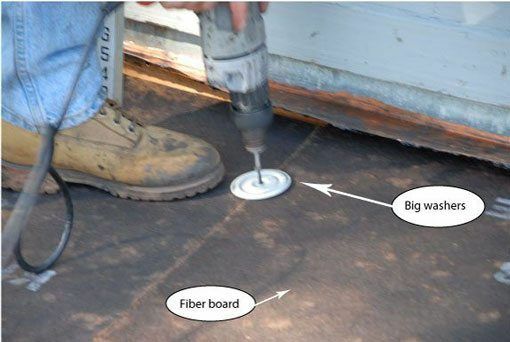 Install a base paper over the plywood. Tar and Gravel roof is removed to prepare for new rubber roof. The stone was to protect the roof from UV’s. It’s very labor intensive to break up an old roof. 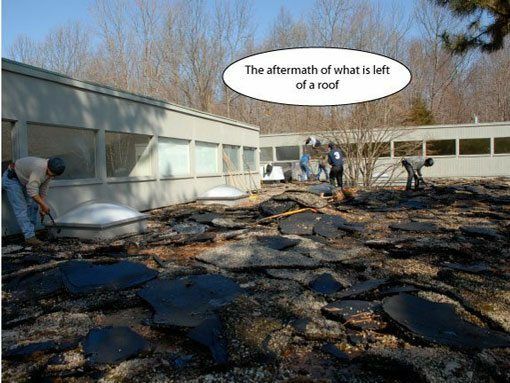 The weight of the aggregate adds to the cost of carting the roofing debris away. It takes a lot of energy to strip and remove an old gravel roof. Many dumpster loads are necessary for removing the aggregate. A top view of stripping a roof. A lot of hands make light work but also costly. 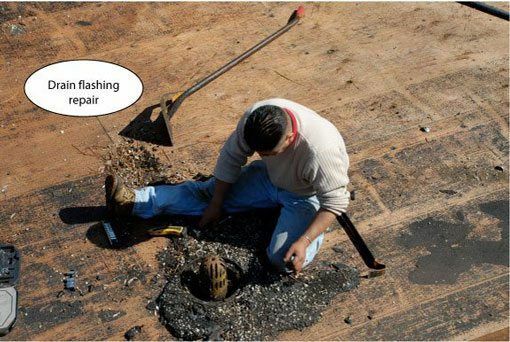 The drains on a roof affect the cost of redoing a roof. 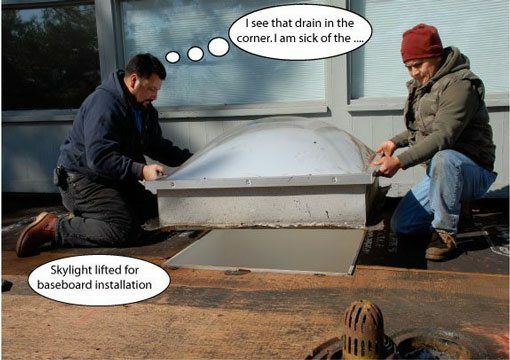 It is always a battle between replacing or reusing the existing drain. Re-using a drain avoid the plumbing cost and the installation of a new drain. The problem sometimes is that the old cast iron drains have so much tar build up and some of them are cracked, meaning it will cost more to repair them than replacing them. 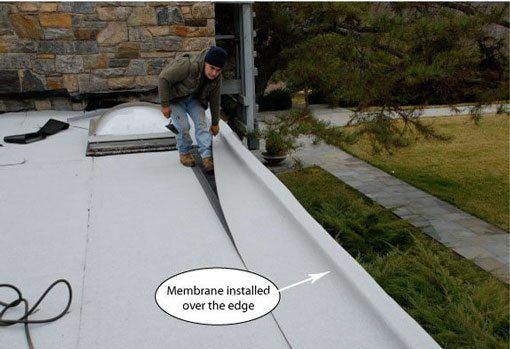 Drains are the more expensive and time-consuming part of a roof installation on a commercial roof. 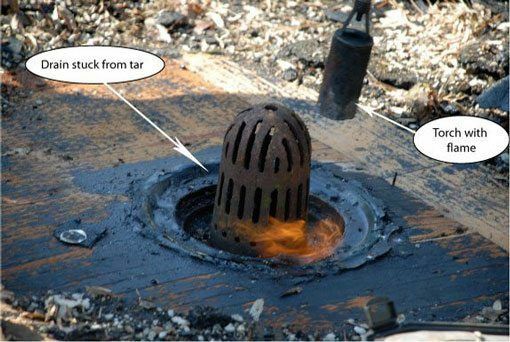 Using Torch heat to melt the old tar to make the necessary repairs to be able to use the old drains again. As the images indicate, while preparing the roof, someone is repairing and preparing the drains for the new rubber roof installation. Finally, the roof is stripped and cleaned. Some areas of the roof were lower than the drains. We installed 1/2″ fiberboard to build the roof up. Some places we had to build it up as much as three inches. Flat roofs are not completely level and can cause water ponding if caution is not taken. 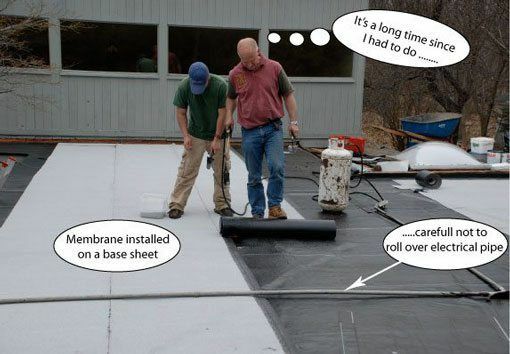 It is important to check the roof levels before installation. It is common that the drains are not positioned correctly for water flow. This where the roof has to be built-up in areas to create positive water drainage. Since the levels of the roof were too low, we had to lift the skylights also about 3 inches. After making sure the levels are right, we then fasten the fiber board with long screws and big washers to the plywood. It is best to use a laser leveler over long distances to get an accurate level. 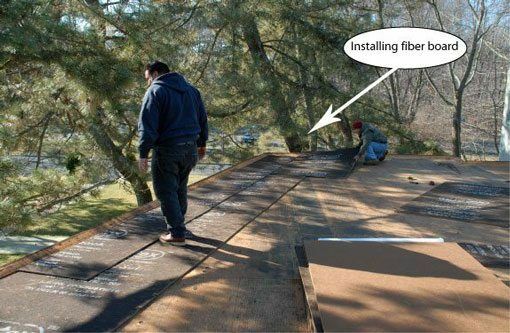 Once a rubber roof installation is complete, there is no turning back to make corrections. 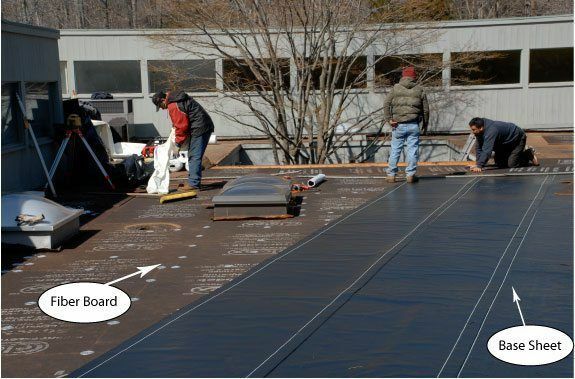 When repairing or preparing a commercial flat roof, flashing is the most important part of the roof. 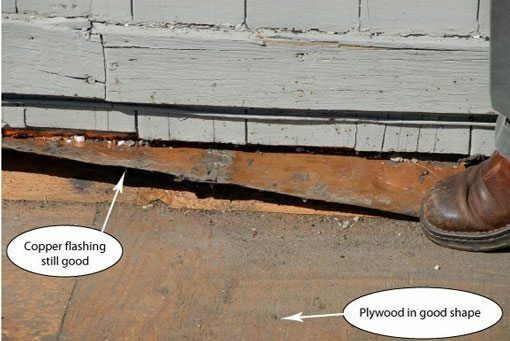 There is flashing against the siding, Air Conditioners, Drains, Vents, and other obstacles. It is important not to damage the flashing when removing the old roof. 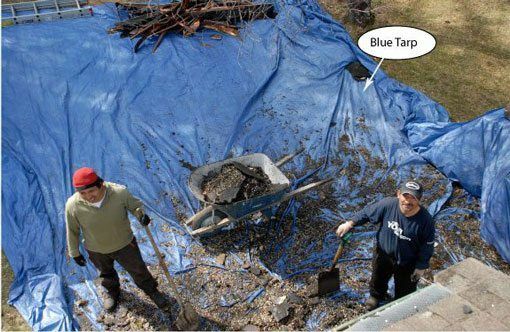 It is important to spread a tarp over the grass and plants for protection against all the roofing debris. It also will help with cleaning up later. We contract a company to provide a dumpster. The dumpster is placed on boards as not to damage the grass or paving surface. 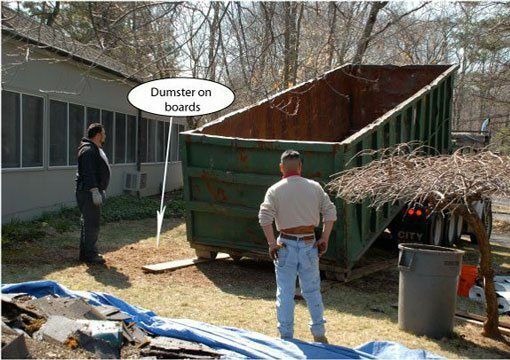 It is very important to have the right size dumpster for removing roofing debris. At all cost, the dumpster should be placed as close as possible to the roof so debris can be thrown into it from the roof. 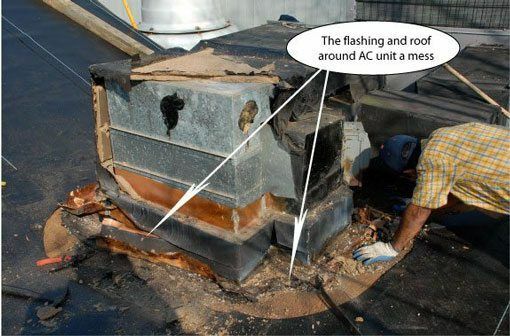 While roof technicians are installing the roof, some areas need preparing as in flashing around the air conditioners. 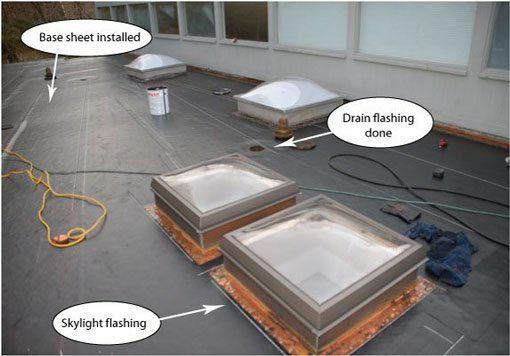 Flashing on any commercial roof takes time to prepare or to install. This is what the flashing around the air conditioner is supposed to look like when everything is cleaned. All roofing tar and old wood and debris are removed. Many times new flashing must be installed. After installing the fiberboard and the levels are satisfactory, then it’s time to install a base sheet. This is a self-adhering peel and stick base layer. Very costly and is almost the same price as the rubber membrane itself. But this is the best system for any roof. 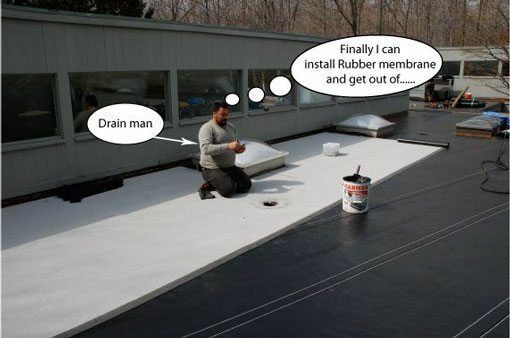 This system will outlast any other roofing material as in EPDM or TPO. 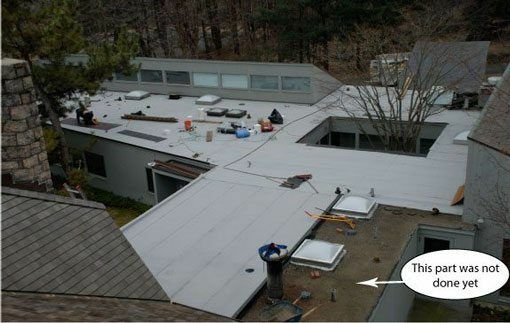 The image shows what it looks like after installing a base sheet and before the installation of a Torch Rubber Roof. All the flashing is clean and ready, all the levels are good. The hard part is over, and the drains look new again. Running the torch and melting rubber is much nicer than cleaning drains. Preparing and repairing a Commercial Roof for a rubber roof will determine what the final product ends up looking. The ultimate goal is to see an even smooth surface with as little as possible water pooling after rain. 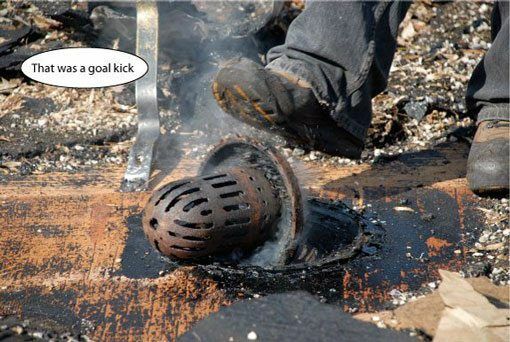 Too much heat and the rubber gets destroyed, too little heat and the seams don’t get welded. You will notice that all our seams are clean. We work with a white granular rubber membrane. The granules are to protect the rubber membrane from the ultraviolets. It takes time to develop the proper technique when it comes to using a torch. 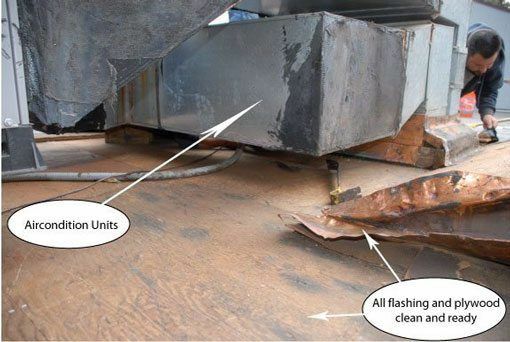 The daily temperature determines how much heat is necessary to weld seams together. Over the years we have improved the installation technique. 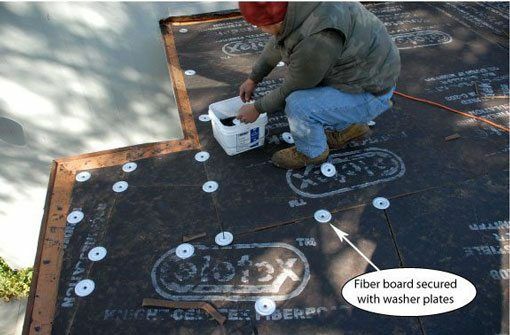 I believe we have a superior roof technique that will outlast any other roof system on the market. Finally – this is what the roof looks like when it’s done. Another Commercial Flat Roof Repair and Installation well done!